If you have a medical condition that makes it impossible to work, you may want to apply for Social Security Disability Insurance benefits (SSDI). To do this, you need to have worked in jobs that paid FICA taxes for a particular length of time to qualify for SSDI. 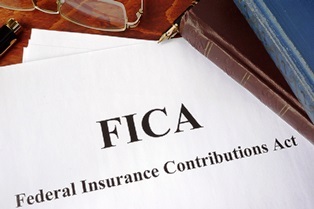 FICA, which refers to the Federal Insurance Contributions Act, is the means by which you pay into the Social Security (SS) system with every paycheck, and your employment history accrues work credits. These credits provide the necessary eligibility for SSDI. Your age and when you became disabled are the two primary factors in determining whether you have enough work credits to qualify for disability benefits. In general, you need 40 total credits, and 20 of these credits must be earned in the last 10 years. Additionally, the number of work credits you need changes each year. In 2019, you earn one credit if you make $1,360. When you receive $5,440 in earned wages, you accrue four credits––this is the maximum amount of credits you can accumulate in a single year. The older you are, the more credits you need to be eligible for benefits. If you’re over 31, you need 20 credits accrued in the 10 years prior to your disability. If you’re 24–31, you must have work history for half that time. So, you must have earned 16 credits in the last eight years to qualify for benefits. If you’re under 24, you must have earned six credits over the prior three years. It’s important to note that there are some exceptions to these age and timeframe requirements for applicants who are blind. Understanding the number of work credits needed for SS benefits eligibility can be confusing and complicated. That's why it's beneficial to hire an experienced SS disability attorney to assist you. The attorneys at Cuddigan Law will explain the guidelines of work credits, evaluate your current status, and help you sort through the requirements for submitting a benefits claim. Having qualified legal representation is essential to understand the SS process and complete a winning application. Contact us for a free phone evaluation. How Much Does It Cost to Hire an SS Disability Attorney?